I’ve spent the past week wondering how I’m going to say goodbye to the organization that shaped the course of my college career. I could fill 16 pages with the stories I’ve accrued over my four years as a member of the Good Five Cent Cigar, and that’s not including my articles. How do you say goodbye to something that changed your life? As an Orientation Leader last summer, I was fortunate enough to advise incoming Harrington School students on what courses to take in their first semester. I’m unashamed to say that I took a good portion of that time to brag about the Cigar. I told them that it was the best opportunity on this campus to learn how to be a journalist. But I didn’t tell them everything. I didn’t tell them that they’ll get used to hearing their roommates’ complaints as potential story ideas, or that they’d eventually be able to write 500 words in a half hour. I didn’t tell them that they would learn how to think on their feet during interviews. I didn’t tell them that asking difficult questions teaches them to confront their fears, or that they’d soon turn into skeptics. I didn’t tell them that working with your friends is much harder than you’d expect because goofing off is sometimes more fun than layout. I didn’t tell them that working on a newspaper will teach them the kind of resiliency and strength it takes to be a leader. I didn’t tell them that they’ll love the Cigar, not because it’s easy, but because it’s worth it. My senior year hasn’t been what I expected. This year with the Cigar was hard, emotionally draining and somewhat defeating. It’s because at the Cigar, mistakes aren’t made in a vacuum, they’re incredibly public. But through those mistakes, I’ve learned. Not just enough to avoid making them in the future, but I learned how to handle critics, when to apologize and when to advocate for myself. I’ve also learned that the people are at the crux of what makes the Cigar so wonderful. I think it has something to do with going through hell and back together. Call me dramatic, but you don’t know unless you know. During my first semester at URI, I joined the Cigar because it seemed like the right thing to do as a journalism major. I was passionate about reporting, but I knew I was a nerd who needed friends that understood what it was like to chase down leads and write in inverted pyramid for fun. Looking back, I can confidently say I wasn’t disappointed. Before I get too personal, to all of the people I’ve worked with throughout my time at the Cigar, thank you. You don’t even know how much I’ve learned from you, grown because of you, and become a better person because of you. To my first former editors, Alli Farrelly, Jake Marrocco and Ryan Wichelns, thank you for welcoming me with open arms as a freshman with a deadline problem, and thank you for believing in me. You told me I’d run this place someday, and I hope I made you proud. To Casey Kelly and Olivia Perreault, half of the “Core Four.” My life is forever changed because you two were a part of it. Thank you for the laughter, the tears, the memes and the indie music. Allie Lewis, I don’t know where I’d be without you (even though we just edit together). I’m thankful for our wordless conversations, and that I had you by my side throughout the toughest days of our term. I couldn’t have asked for a more talented, dedicated and capable best friend to lead this paper with me. Thanks for always “running towards danger” with/for me. Caitlyn Picard, I’m glad I dragged you to the Cigar. 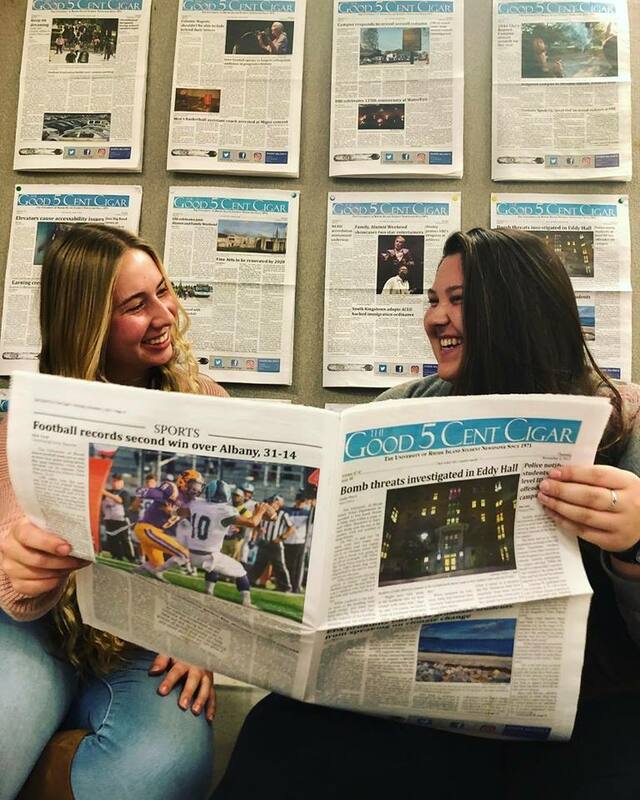 I loved watching you grow as a reporter and an editor, and having you on staff made my job so much fun. Thank you for being ridiculous with me, and for your willingness to go get dollar margs. Lianna Blakeman and Nick Bush, my fearless leaders. Working with the both of you this semester has definitely been an exercise in self discipline, and I thank you both for showing me how to be a good mentor and a good employee. I hold you both in the highest regard for leading the newspaper through some pretty rough times with courage and resilience. To Sam Murray, Kelsey Santmyer, Ian Weiner, Theresa Brown, Julia Moro, Autumn Walter, Zack DeLuca and Stone Freeman, the rest of the staff and the next generation, I can’t wait to see what you’ll accomplish next. Thank you for being some of the best friends and coworkers I’ve ever had. Joining the Cigar my freshman year was undeniably the best decision I’ve made so far. It’ll be tough, letting go of something so formative in my life. But I’m ready. I know it’s all part of the process, and in some ways, I’m actually glad to be upset over ending my tenure with the Cigar. It means that I’m fortunate to have loved something so much.